The Headlie Taylor Header and Blacksmith Shop Museum was officially opened in Bicentennial Park Henty NSW on 12th March 2010. 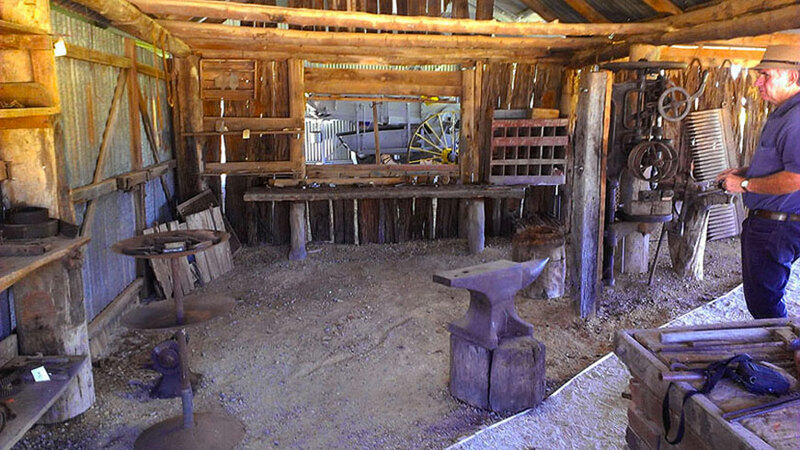 The Header had been previously displayed in the Memorial Park Henty and the Blacksmith Shop was slowly deteriorating where it was originally constructed on a farm 6kms north of Henty. The drilling machine used by Headlie Taylor in the construction of his prototype headers. Located within the blacksmith shop at the Header Museum. This drill is featured on ABC Open. See link below. The header on exhibition at the museum was built by members of the Henty branch of the United Farmers and Woolgrowers Association in 1969. For 12 months they collected old machines and parts wherever they could find them. Frank Howard from Milbrulong near Lockhart, who actually worked on one of the headers, supervised the construction. 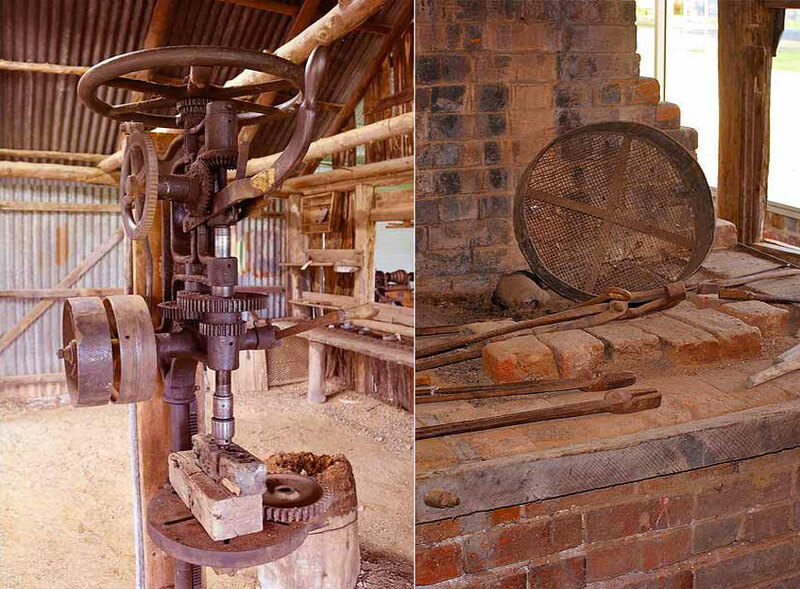 The blacksmith shop was re-located to the Headlie Taylor Header Museum in Bicentennial Park Henty in 2010, having being originally built by Headlie’s father on the property “Emerald Hill” circa 1880/1885. The blacksmith shop is a small, earth floored, pole framed shed with a gable roof running north-south and a skillion added on the west side. 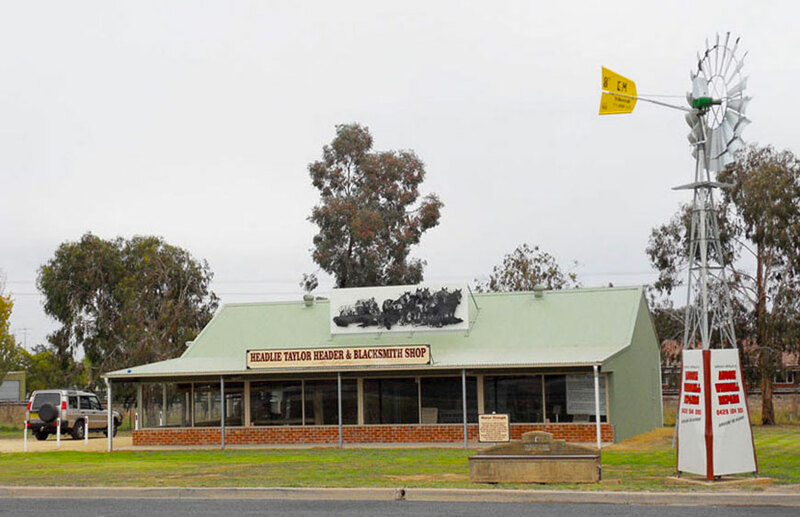 The town of Henty has seen its fair share of innovative machinery, with Henty playing host to the machine of the year award at the annual field days, but no invention has surpassed that of the local Headlie Taylor’s Header. Taylor’s Header revolutionized the grain industry worldwide and dubbed Henty the ‘home of the header’. Hugh McKay’s Stripper Harvester was invented in 1880s, but the stripper harvester had trouble picking up grain crops that were down and so emerged Headlie Taylor with his Header Harvester in 1914. His harvester was debuted at the Henty Show to much excitement among farmers. The header harvester ‘lifted’ the heads of damaged crops to collect grain that would otherwise be lost. 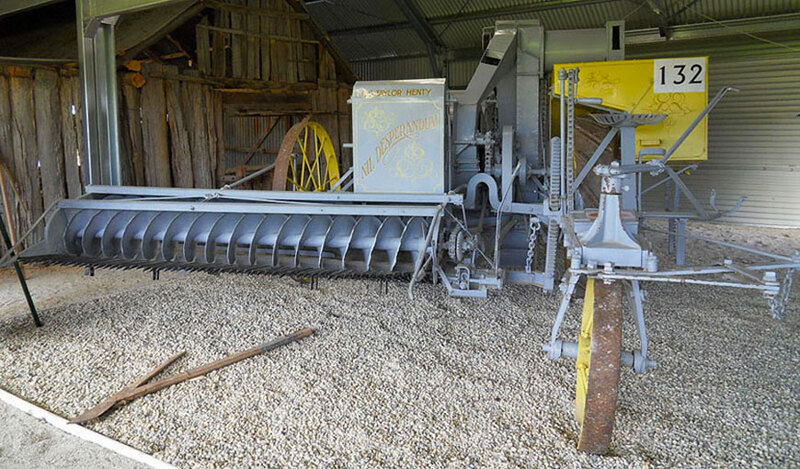 The header harvester soon replaced the aging Stripper Harvester, and began the trend of bulk handling of wheat in Australia. This agricultural innovation has been commemorated by the Headlie Taylor Header and Blacksmith Museum in Henty. Guided tours are available by appointment.